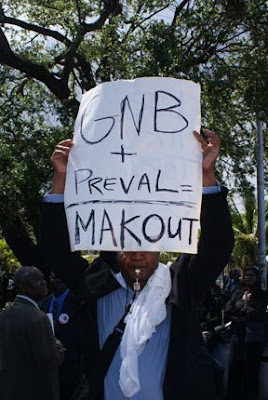 Look at What Haiti's Tyrants Did To Me! 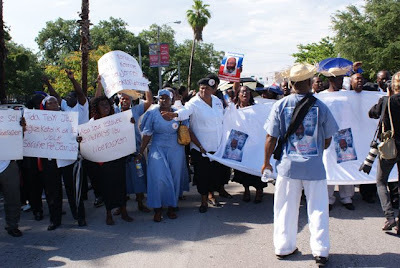 Ezili Danto has written an account of the trials of Father Jean Juste in seeking medical attention in a Miami hospital. 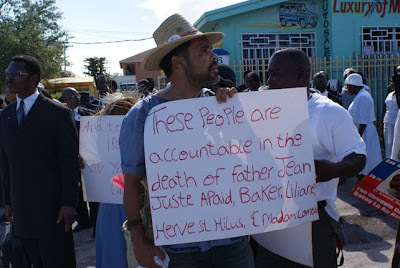 Father Jean Juste endured cruel treatment when he was ill and dependent. It is indicative of the manner that the poor are treated in general in this world. A sad and last irony that he was not afforded the dignity to die in peace. He fought against ill treatment of the poor only to have the same treatment visited on him in his last days. 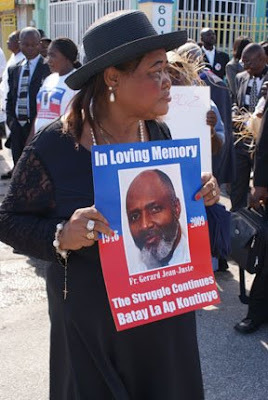 Father Jean Juste first contracted Leukemia while held for seven months as a political prisoner by the US appointed de facto government of Gerard LaTortue in Haiti. 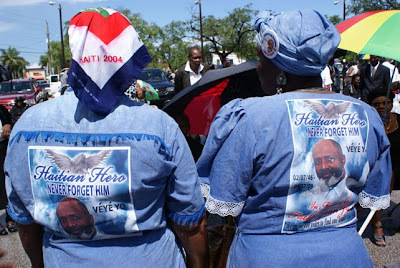 "During his last hospitalization in Miami, in January of 2009, when the hospital insisted Father Jean Juste had to give up the hospital bed and leave without the medication he couldn't afford, even though he was almost at death's door unable to breathe with a respiratory problem, these women of Veye Yo, who sat with him, took turns sleeping in the hospital to comfort him, relayed this to be close to his very last words, said with some strength before he would fall into semi-consciousness. Jean Juste, a fighter to the end, told the Miami hospital that was refusing him medical care that he could not leave without three things - he asked for a wheelchair, medication for the pain and gas for his respiratory tank. The hospital refused because they said he owed too much money already and needed to pay at least half of "perhaps more than $60,000, I am not sure but he owed a lot" recalls Veronique Fleurime of Veye Yo. No Church official was there. 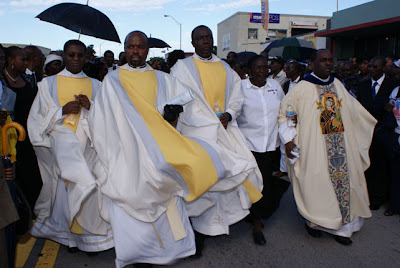 Father Jean Juste had been fighting for human rights and equal treatment in Miami for Haitians since before 1979 when he headed Miami's Haitian Refugee Center. Ultimately it was "Ben" from Veye Yo who would hurry and apply for Medicaid to stop Jyeri from being thrown out of the hospital without any medication while so ill. Reportedly, the hospital's social worker, charged to do this task, never put the Medicaid papers through." Read more. 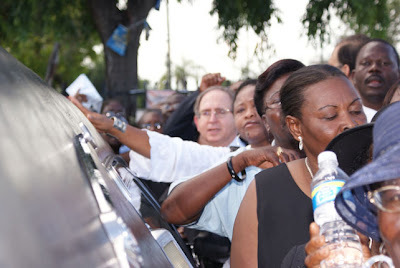 The article also blasts the uneven and biased coverage by the Miami Herald of the Father's death. Ezili points out that, "For every good word they are forced to say about him, there's an awful jagged-edged pen-knife-stabbing ahead or below it. 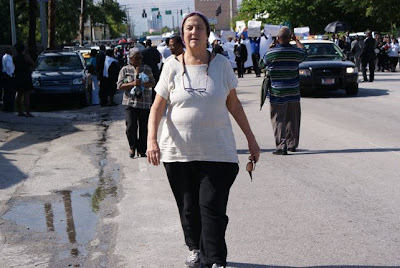 To wit: ''The jail time, the illness brought a lot of wisdom,'' Jean-Mary of Notre Dame said. ``I wish he had developed it earlier. At the same time, you have to respect his convictions. He was a fighter.'' 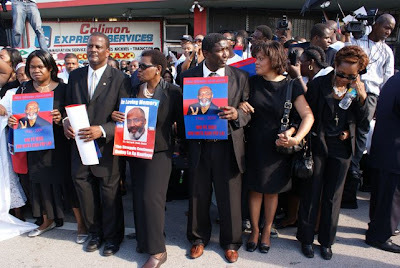 (Miami Herald, June 7, 2009)"
to Veye Yo behind hearse that carried Father Jean Juste's body. 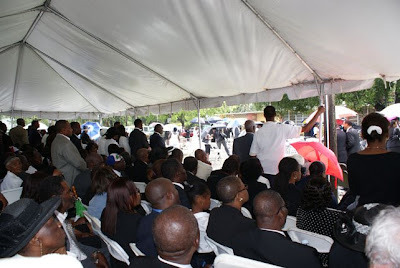 Mourners listening to service under tent outside crowded church. 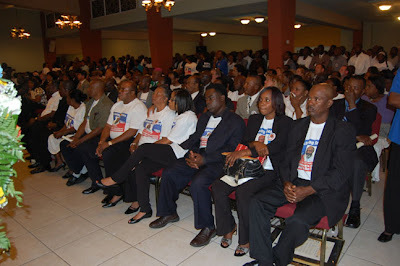 June 6, 2009 at Church memorial for Father Jean Juste. 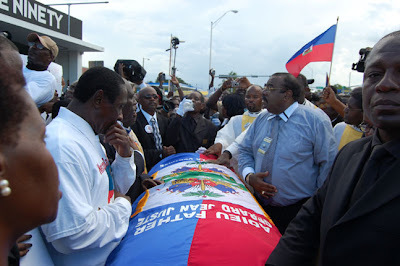 hearse that carried Father Jean Juste's body. 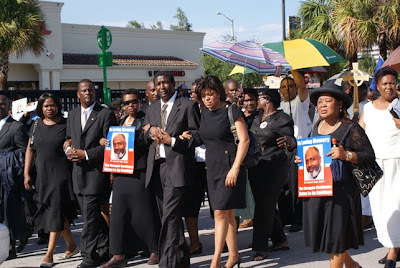 The funeral walk. 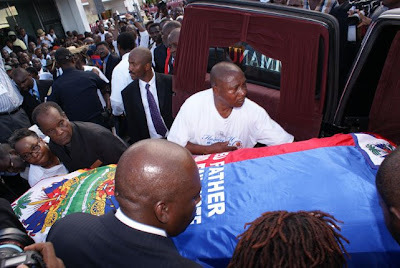 The casket that carried Father Jean Juste's body. 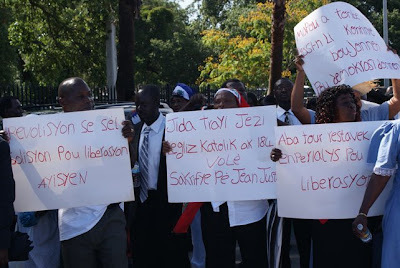 Sign displays displeasure with the Catholic Church and the Haitian Oligarchy. 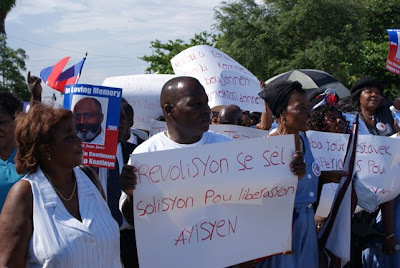 Placards read "Revolution is the only solution for the liberation of Haitians." 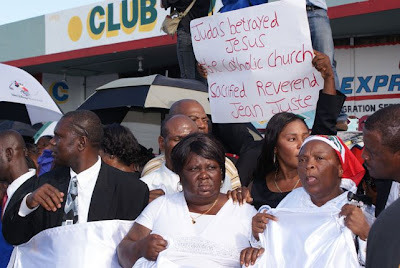 "Judas betrayed Jesus, the Catholic Church with Group 184 steals, sacrificed Father Jean Juste." "Down with the collaborators and imperialists for liberation"
memorable Church sermon during the wake, on Friday, June 5, 2009, about the hypocrisy of those who persecuted Father Jean Juste, yet now can't rush to the frontlines fast enough to praise him at his funeral in order to leverage his reputation in the community for their own political capital. 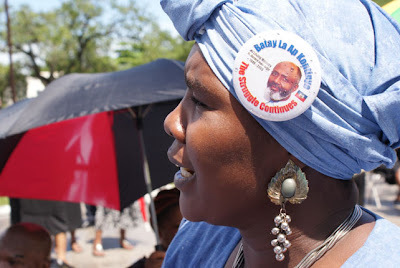 with a button on her headress for Jean Juste. 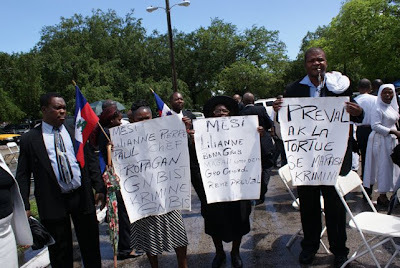 Karabela Haitian dress proclaiming Father Jean Juste a Haitian Hero. 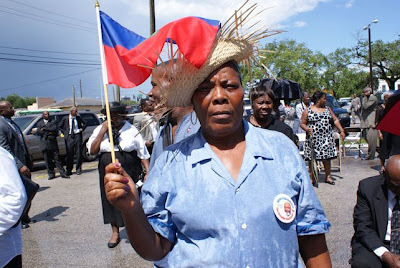 with a Zaka hat waiving the Haitian flag, remembering Father Jean Juste. 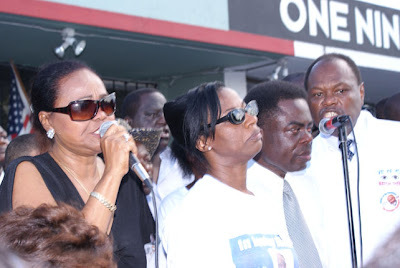 Andre Apaid, Charles Baker, Lilliane Pierre Paul, Herve St. Hilus and de facto Culture Minister, Magalie Comeau-Denis whose false accusations imprisoned Jean Juste and who, speaking during the funeral for Jacques Roche, wrongly pretended Jean Juste had something to do with Roche's death, going as far as to call Jean-Juste "a symbol of the reign of violence in Haiti." Church of crucifying Father Jean Juste. 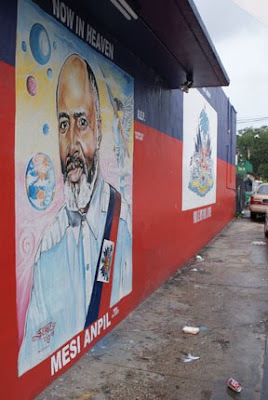 Tap Tap Haitian Restaurant in Miami and Crowing Rooster Arts. grassroots organization on 54th Street. at Veye Yo on 54 Street, Miami, Florida. 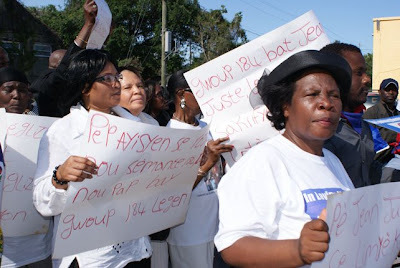 Father Jean Juste's grassroots organization on 54th Street.